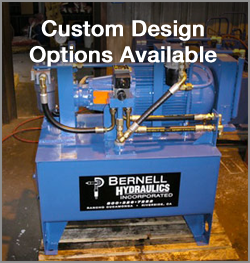 At Bernell Hydraulics, we’ve created numerous custom hydraulic systems San Bernardino CA for our clients, from spinning machines to conveyer hydraulic units. We invite you to choose us for your next custom project. By providing complete design and manufacturing services under one roof, we make it easy and convenient to take your project from conception to completion. You can come to us with an idea for a machine and leave with an expertly designed, fully functional custom system that is perfect for your needs. We will use as many name-brand parts as possible, placing them in a custom housing and custom configuration. When name-brand parts won’t do, we can machine our own. Our engineers and machinists are ready and willing to put their talents to work for you. Whether you ordered your custom hydraulic systems San Bernardino CA from us or from another contractor, we can provide superior maintenance and service. When you call us for help, we can even come to you at your worksite in the event of a breakdown. As a licensed supplier of Parker parts, we can help you get the name-brand parts you need quickly and efficiently. We can even create custom-made replacement parts if that’s what you need. Our Hose Doctor on-site hose repair and replacement system is also available for custom systems. Custom hydraulic systems San Bernardino CA can be a big investment, so you need to know you’re choosing the best possible contractor for the job. At Bernell Hydraulics, we’ve been in the business of keeping hydraulic equipment in peak operating condition since 1977. Our custom design and manufacturing department is staffed with experts who know how to get the job done right the first time.